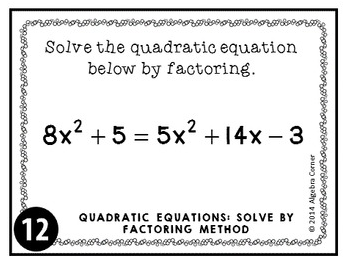 This activity is intended to help students practice the skill of solving quadratic equations using factoring method (although the problems can be solved by other methods as well). It contains 16 problems with varying levels of difficulty. You may require students to write their detailed solutions on separate sheets of paper. Engage students by using these task cards in various ways such as in math stations, in a scoot game activity, or for daily warm ups. A recording sheet and an answer key are also included! I truly hope that this resource can help your students succeed in math. If you have any questions or concerns about this product, please feel free to contact me at algebracorner@yahoo.com. I sincerely appreciate your support!